According to Animation World Network, Toei Animation and Eleven Arts are set to release the latest Digimon anime feature in an English-language version for North America this fall. 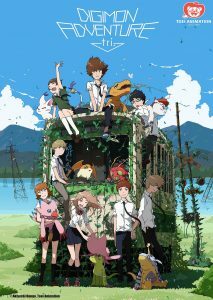 Entitled Digimon Adventure tri. – Chapter 1: Reunion. (whew! ), the film is set to premier as a one-day-only Fathom Events screening at select theaters, followed by a more traditional roll-out to various cities. “It’s been six years since the summer adventure when Tai (now in high school) and the rest of the DigiDestined crossed over to the Digital World and nearly three years since frenzied final battles between warring factions. With the gate to the Digital World closed, time continues to pass, until the adventure Digivolves once again.” Unfortunately, being from a different generation of Digimon, it’s unlikely that Guilmon or Renamon will make an appearance in this film. Pity! Anyway, look for this exclusive screening in one of 300 cities on September 15th.